Did you know that the Phillie Phanatic loves to read? He does! He even enjoys hanging out with other book lovers. That’s why he and the Phillies teamed up with the Free Library of Philadelphia to offer special prizes to a select group of outstanding readers. 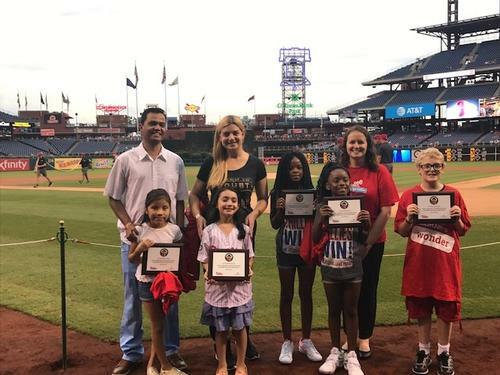 Our librarians nominated some of the most adamant Summer of Wonder readers for the Phillies’ Be a Phanatic about Reading program, presented by Comcast. Five lucky children ended up winning those coveted spots at a game against the Atlanta Braves.Congratulations to: Angela H., Pepper J., Aiden F., Maliyah A., and Dasia A.! These winners also had the honor of visiting the pitcher’s mound in the center of Citizens Bank Park and special photo ops on the field. They also won extra tickets to bring family members to the game as well as the librarians who nominated them. The Be a Phanatic about Reading program encourages children to read daily in order to improve their literacy skills. To win tickets to the game, nominees needed to be entering K-8th grade and actively participating in the Summer of Wonder at their neighborhood library. Phillies tickets are only some of the prizes that Summer of Wonder participants have won this season. Lanyards, backpacks, gift cards, pizza parties, Museum of Art and Rosenbach Museum passes, and so much more have also been given out. Did you win anything yet, Philadelphia? It’s not too late to sign up for Summer of Wonder online and enter for a chance to win something. Our Be a Phanatic about Reading winners on the Phillies baseball diamond. The Be a Phanatic about Reading program is presented by Comcast. The Phillie Phanatic loves to read! 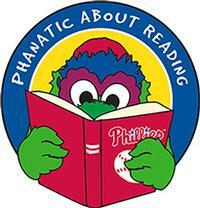 Add a Comment to Be a Phanatic about Reading!